What are some things you use every day? I bet I can predict with great certainty a few of them. Let's see. I'm guessing you use your toothbrush every day. How about water? Electricity? Hopefully clothes, unless you are appearing on the reality show Naked and Afraid. Good grief. What will they think of next? Umm...I'm guessing you use a bed every day (or night), probably a car, and you can't forget this next one. It's very important. You probably use a toilet every single day. It's necessary, right? I'm sure you're amazed right now at my ability to know you so well. It's almost like I know everything about your daily life. You might be a little creeped out. Has that crazy Twitter principal been stalking me? But wait, I'm not done yet. There is one more thing I bet you use every day. In fact, I think you might be using it right now. Most of us use one or more of these nearly every singe day. If you are a teenager, you might have confused it with one of your other four limbs. That's right. You guessed it. It's a connected device. For you teenagers, that doesn't mean it's connected to your body. It could be a mobile phone, a laptop, a Chromebook, an iPad, or one of the many other varieties out there. We like to connect every day. I'm guessing many of you even use several of these devices during your typical day. You probably have a couple at home, at least one at work, and a smartphone that goes with you everywhere. I just ran around our house and did a quick audit. Drum roll please. I counted 29 web connected devices in our home. We need to have a garage sale. Of course, who would buy a Palm Pre smartphone? It was a great device in 2010. Just shows how irrelevant a device can be in just six years. The Palm brand has gone the way of the dinosaurs. Extinct. So last year was the first year our school was 1:1. Every student had a Chromebook to use for learning every day. One of the reasons our school made this move was because we all use technology in our everyday lives, so why should school be any different? Before 1:1 came to Bolivar High School, using technology was not necessarily an everyday thing. We had computers in the library, in computer labs, a few scattered around in different classrooms, etc. But there was not consistent access. Some students rarely used a device for learning. As we made the transition to 1:1, we knew every teacher was in a different place in terms of their comfort and skill with using technology. Of course, we are always striving to increase the comfort and knowledge of our staff. And we like to nudge people out of their comfort zone, too. But since everyone was in a different place, we didn't set any universal expectations. There weren't any quotas or mandates on how to use the Chromebooks. Every teacher is unique, and the curriculum they teach is unique too. So we didn't expect everyone to use the Chromebooks in the same way, or equally as often. We simply asked everyone to look for ways the technology could provide value and enhance learning for students. And I believe every single teacher in our building used the Chromebooks to support learning in one way or another. That's a good thing. But even though all of our teachers were open-minded and supported the need to go digital as a school, some just didn't see the relevance as strongly for their classroom. I'm guessing there were a whole variety of reasons the devices were used or under-used in each classroom. But consider these questions. Do you have multiple devices in your home? Do you rely on a device daily? Is your ability to connect important to your learning? Do you feel your ability to connect is empowering to you? If you are a digital learner, I'm guessing you answered yes to those questions. Even if you didn't answer yes to all of the previous questions, consider the following. Do most professionals use devices every day? Are the most successful people connected learners? Is our world becoming increasingly digital? Will more opportunities come to those who are competent digital learners? 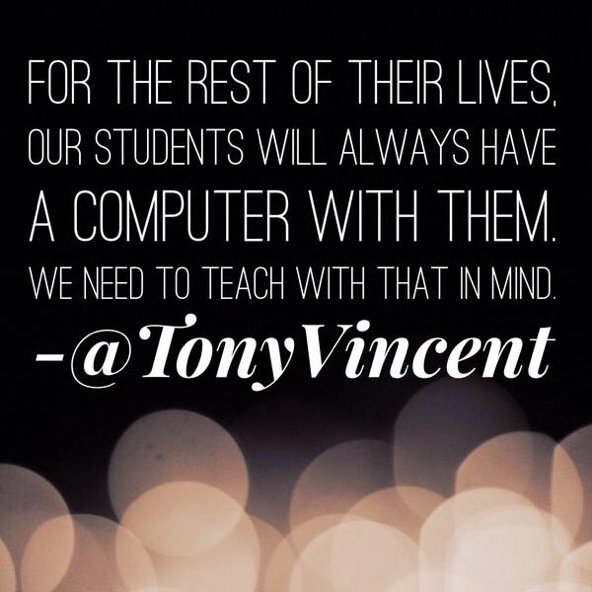 It just seems obvious to me that our students will need to be digital learners to be successful in the future. Heck, they need to be digital learners now in order to get the most from their school experience. There are tools and resources available online that far exceed the resources we could provide otherwise. And almost every school has realized this to some extent. I haven't visited a school yet that isn't using computers or digital learning in some way. But technology should be an every day thing. It shouldn't be a special event, a remediation strategy, a canned learning program, or an enrichment activity after the real learning is done. It should be an authentic part of learning. It should empower us, connect us, and give us new opportunities. It should stimulate curiosity, creativity, and help us solve problems. 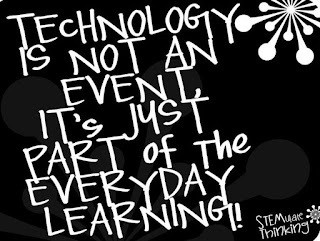 Technology can be used to support learning, but it can also be used in ways that transform learning. And it is far more likely to be transformational when it is used regularly. It just becomes a normal part of learning and not an add-on or special event. 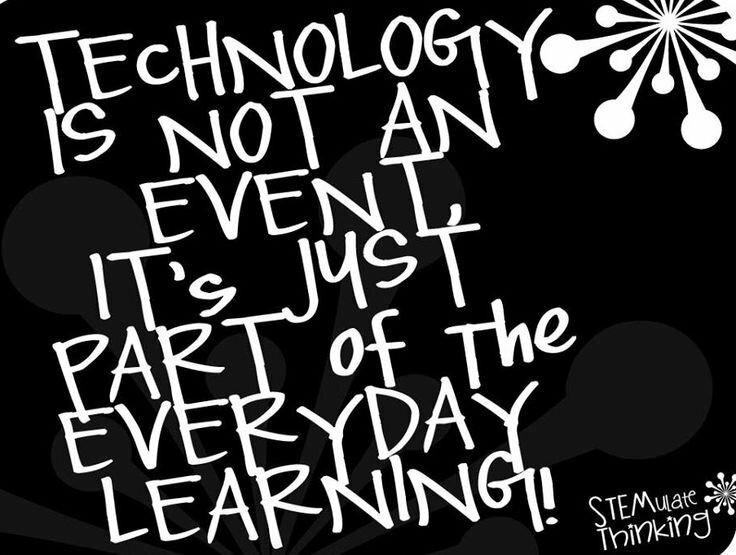 Now you might be thinking that using technology in every class, every day sounds rigid. And don't we sometimes need a break from tech? Don't we need to unplug occasionally? Aren't students using technology every day anyway? Some students are probably using technology too much, right? We absolutely need to keep some balance in mind. Too much screen time can be bad for us. We need to unplug from time to time. I took a month-long break personally in July 2015. There are benefits to pausing and stepping away from devices. Schools must incorporate technology into daily teaching to realize the benefits. The daily use of technology in core classes correlates highly to the desirable education success measures (ESMs). 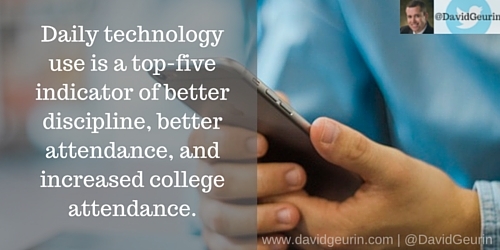 Daily technology use is a top-five indicator of better discipline, better attendance, and increased college attendance. The Project Red report shows how powerful technology can be when it is used effectively. There were all sorts of positive outcomes in schools that implemented technology well, including the benefits found from daily use of technology instead of intermittent use. 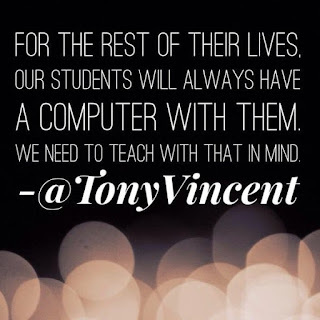 So I would challenge you to consider how you are using technology in your classroom. Is it an every day thing? Even if your students don't have access to school-issued devices, what can you do to help them develop as digital learners? I would love to hear from you. Leave a comment below or respond on Facebook or Twitter. Here we grow!